We have been getting quite a few questions about cleaning chrome wheels that we didn't know the answer's to, so we asked the experts. "How do I keep my chromed wheels in their best condition?" The infamous Chrysler Chrome Wheels! It's a good bet that most of the people visiting this page looking for answers to their corroded chrome wheels have a set of these. The black tarnishing cannot be removed, but the wheel can be repainted in a silver finish. To make sure you get many years of pleasure from your wheels, there are a few points we wish to address regarding chrome plated wheel care and maintenance. 1. Fine spray rinse wheels/spinners off with water. 2. Mix car shampoo wash & wax with water in a bucket and wash wheels with sponge. 3. Rinse off wheels with water. 4. If wheels are still dirt/brake dust stained use a chromed wheel only cleaner! 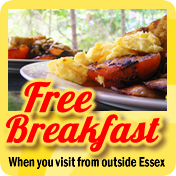 Simply spray it on a, lightly scrub with a sponge if required, hose it off, simple! 5. Once dry use a car wax to add a protective layer. Wax helps to protect the chrome finish by adding a protective layer. Dirt and brake dust will stick to this rather than the chrome finish. Making cleaning a lot easier. It is best to wash the wheels once a week to help stop brake dust and dirt being ground-on. 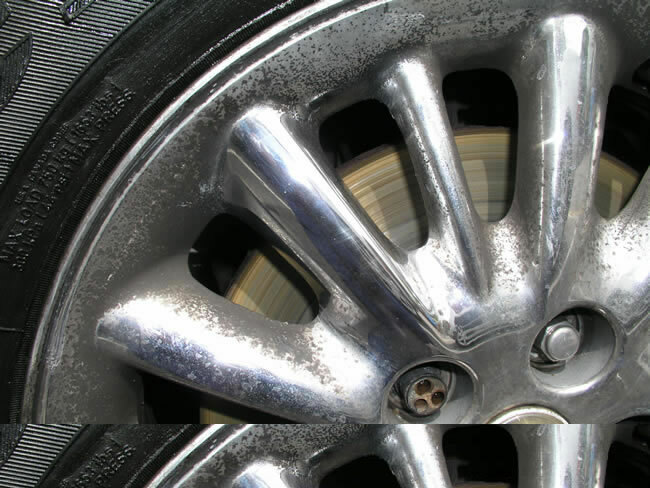 If you ignore cleaning your wheels brake dust, salt and dirt will pit the finish, as moisture in the climate will react with the chrome plating. Do not use car washes, the detergents used could damage the chrome finish, or the chrome finish could get scratched. Don’t use any wheel dirt/brake dust cleaners than can’t be used on chromed wheels, the acid content could effect the finish, we only recommend what is listed above. Our Rule Of Thumb: If you are unsure of how to clean and maintain your wheels use only what you would use on the body of your vehicle to clean. & can chromed wheels be re-chromed?" 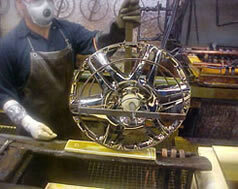 If you kerb the wheels we advise you to use a clear lacquer, like clear nail polish to reseal the chrome finish. If you do not, moisture could get underneath the chrome and cause the overall finish to deteriorate. 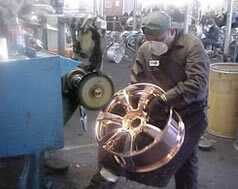 Chromed wheels or standard alloy wheels CANNOT be re-chromed in Europe. 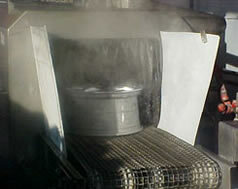 The processes used in the chrome plating are generally not allowed because of costs and environmental issues relating to the fumes emitted. If you damage a chrome wheel there is no way to get them back to their original finish, you have to purchase another wheel. Update: However, they can sometimes be rubbed down and repainted to a silver normal finish. 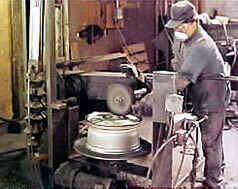 In fact, some taxi companies were solving the problem of the infamous Chrysler Chrome wheels [photo], by having them painted before corrosion ever started in. "How are wheels chrome plated?" Unlike conventional alloy wheels that are spray painted to a silver finish, a chrome finish is a very long time evolved procedure. 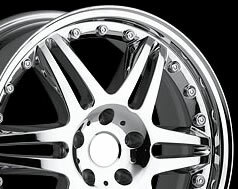 This is the reason why chromed wheels are more expensive than the conventional wheel finishes. 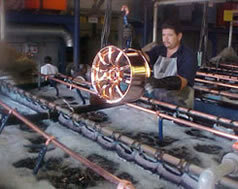 Wheels are CNC machined to their shape in alloy, then through many processes (see below) the wheels are then buffed to a high lustre, rinsed, copper-plated, copper-buffed, nickel plated, chrome plated and rinsed. Wheels are then cleaned and ready to pack. 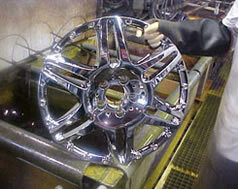 Cruzin On Chrome are specialists in Chrome Wheels, Chrome spinners, and accessories for Chrome Wheels. 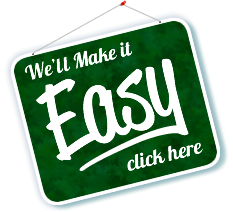 They also supply chrome badges, custom parts and conversion kits. This Company DOES NOT replate alloy wheels. 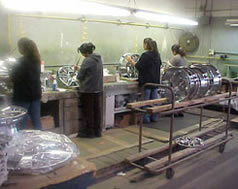 However, They do have the equipment needed for stripping alloy wheels and they can replate other chrome part.